FC Barcelona defeated Real Madrid in their own stadium for the third consecutive season with a memorable 3-0 win. This result meant that they are 14 points ahead of Real Madrid at the top of league standings. Coupled with both second place Atlético and third place Valencia losing in this round, Barça enter the winter break with a 9 point and 11 points gap ahead of both clubs. The game was a tale of two halves. Barça’s first half was one to forget as their arch rivals enjoyed the majority of possession and influence. The Blaugrana struggled to gain control and Messi could not make an impact thanks to Mateo Kovacic’s marking him. However, the hosts though could not make the most out of their chances, thanks to a combination of some superb stops by ter Stegen and poor finishing by Madrid’s forward, while the best chances fell to Paulinho who was denied by Navas before both sides entered the break scoreless. The second half would be all Blaugrana. Madrid came out sluggish and Barça made them pay for it by breaking the deadlock soon after the restart. In the 54th minute, Busquets calmly found Rakitic in the center of the pitch and the Croatian international carried the ball through a giant gap in Madrid’s midfield, thanks to Kovacic still man marking Messi. 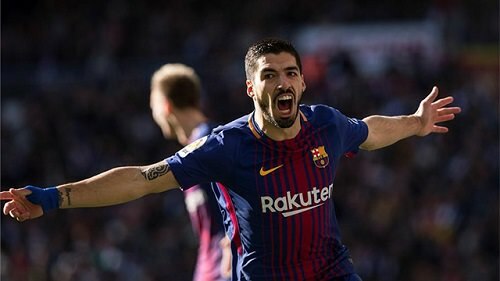 Rakitic then fed the ball to Sergi Roberto whose one touch low cross was perfect for Luis Suárez to draw first blood and silence the Madrid crowd with his 10th league goal of the season. Madrid were rattled and Barcelona were bursting with energy and confidence. In the 63rd minute, Barcelona were awarded a penalty after Dani Carvajal intentionally stopped Paulinho’s goalbound header with his hand. For his efforts, he was shown a straight red card and Messi converted from the spot to score Barça’s insurance goal. 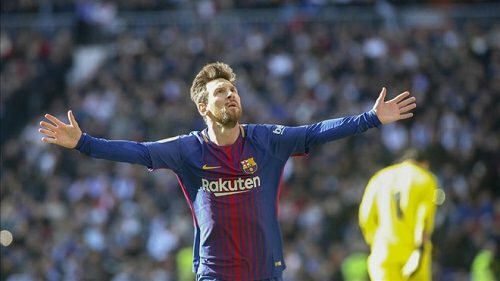 This goal would be a historic goal for Messi as it was his record 25th goal Clásico goal, 15th goal against Real Madrid (the most by any player against them) and also his 526th goal for the club which is a new record for most scored for a single club, all the more the reason for Messi to celebrate that achievement with a memorable goal celebration in front of those in attendance at the Bernabéu. It was also his 15th league goal of the season which is tops for the Pichichi. The Blaugrana enjoyed playing the final half hour against a short handed Madrid side but could only add one further goal to the scoreline. 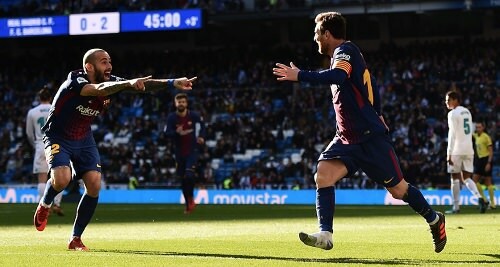 In the third minute of stoppage time, Messi managed to elude Marcelo, while losing a shoe in the process, before slotting the ball on the ground across the box. Substitute Aleix Vidal managed to meet the ball and his effort wiggled past Navas for the third and final goal of the game and his first league goal of the season. 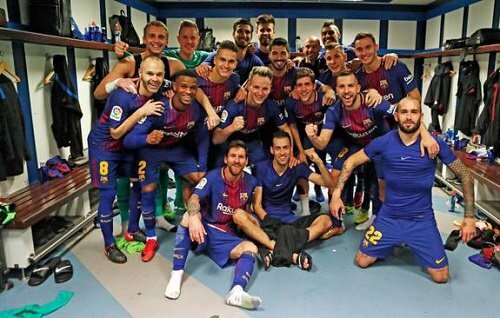 Moments later, the referee blew the final whistle and Barcelona were celebrating a third consecutive league victory at the Bernabeu which had never happened before in the history of this rivalry. The Blaugrana enter the winter break with a comfortable cushion in the league standings. 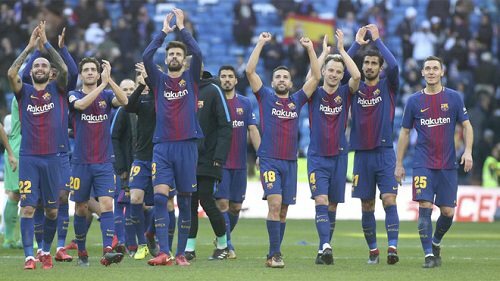 Their first action in the New Year will be away to Celta Vigo in the first leg of their Round of 16 Copa del Rey clash on January 4, 2018 and their first league action will be at the Camp Nou on January 7 against Levante. Real Madrid: Keylor Navas; Carvajal, Varane, Sergio Ramos, Marcelo; Casemiro (Marco Asension, m.73), Kovacic (Bale, m.73), Kroos, Modric; Cristiano Ronaldo & Benzema (Nacho, m.66). FC Barcelona: Ter Stegen; Sergi Roberto (Aleix Vidal, m.90), Piqué, Vermaelen, Jordi Alba; Busquets, Rakitic, Paulinho (André Gomes, m.84), Iniesta (Semedo, m.76); Luis Suárez & Messi. Goals: 0-1, Luis Suárez (m.54); 0-2, Messi (m.64 – penalty); 0-3, Aleix Vidal (m.93). Cautions: Ramos (m.59) & Marcelo (m.83); Vermaelen (m.18) & Busquets (m.88). Previous PostBarça win Group D after scoreless draw against Juventus. Next PostBarça play to a 1-1 draw against Celta in first leg Copa clash.